The iMac 2019 is finally here, and while it doesn't look different from the all-in-one computer last upgraded two years ago, it does get a much-needed specs update. Apple is outfitting the 21.5-inch and 27-inch iMacs with 6- and 8-core processors for the first time, and both Retina iMacs are available to order today and ship next week. Today's update promises up to 60% faster CPU speeds from 8th-generation Coffee Lake and 9th-gen Coffee Lake Refresh Intel chips, and up to 80% graphics performance from new Radeon Pro Vega GPUs. No, there's no iMac 2019 redesign. Apple is simply closing the gap between the iMac meant for most people and the Intel Xeon-powered iMac Pro ideal for workstations. 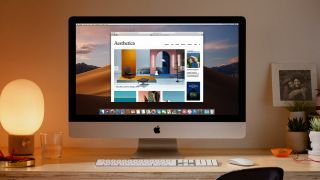 The 21.5-inch iMac 2019 starts with an 8th-generation quad-core Intel processor at $1,299 (£1,249, AU$1,999, AED 5,459), but you can crank that up to a 6-core processor for an additional cost. Apple's top-of-the-line 21.5-inch iMac configuration offers an Intel Core i7 processor, which is a chip that was previously only an option on the larger 27-inch iMac. The Radeon Pro Vega 20 GPU, with 4GB of high-bandwidth memory, is where we see the biggest gains. Apple claims up to 80% faster graphics performance here. There's one holdover from the iMac 2017 era that's still on sale. Starting at $1,099 (£1,049, AU$1,599, AED 4,619), the entry-level iMac isn't seeing an update inside or outside today. The 27-inch iMac 2019, with its lush-looking Retina 5K screen, is where you see a mix of 9th-generation 6-core and 8-core processor configurations starting at $1,799 (around £1,749, AU$2,799, AED 7,559). Gone is the base line option for four cores here, and Apple is clocking this upgrade as up to 2.4 times faster on the CPU side when you spring for the 9th-gen Core i9 chip. It sees a boost of up to 50% faster on the GPU side with AMD Radeon Pro Vega 48 graphics that can be configured with up to 8GB of memory, capable of 7.3 teraflops. All of this translates into faster performance for demanding applications. Photoshop sees a 70% performance increase, and Final Cut Pro X more the doubles the multi-cam 4K Pro Res editing cap from 7 to 16. The iMac 2019 is shaping up to be a suitable upgrade for anyone who has had iMac Pro envy, but doesn't actually need workstation-class power or a $4,999 (£4,899, AU$7,299, AED 20,999) price that matches. It won't, however, satisfy everyone seeking dramatic change from the 20-year-old iMac line – especially those looking for that still-elusive iMac redesign in 2019. Apple is stick with the familiar aluminum-and-glass design, 5mm thin profile and that sizable chin on the bottom of the display to almost proudly sport the Apple logo. The good news is that the starting prices remain unchanged from two years ago (except in Australia, where it's AU$100 more expensive), and the modular Mac Pro 2019 does promise the change many are clamoring for.